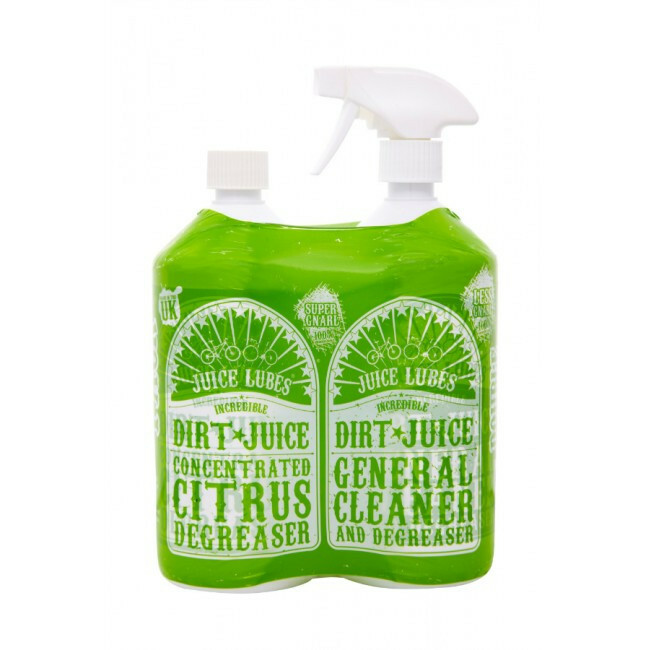 The Dirt Juice Double Pack is our Dirt Juice Super Gnarl 1 Litre strapped firmly to a bottle of Dirt Juice Less Gnarl with trigger spray. As you may already be aware the Dirt Juice Super Gnarl is a concentrated degreaser for use neat on drive trains and cleaning bearings and the Less Gnarl is a ready to use bike cleaner. By diluting the Super Gnarl 10:1 with water you can make your own Less Gnarl general cleaner, so as you can see this is a big value product giving you up to 12 litres of cleaner! That should last you a good while!! .